“Do I look like I’m from Sacramento?” Lady Bird asks her mother in the opening line of the film. “You are from Sacramento,” she replies. Right from the start the Oscar-contending film, Lady Bird, begins drilling home its theme. Christine “Lady Bird” McPherson is struggling with what every teenager struggles with: Identity. Who we are versus how we wish the world would see us. Lady Bird hates so much about her life. She hates her given name, Christine, insisting everyone call her Lady Bird. She hates that she lives in Sacramento, she hates that her family is poor, and she hates that she’s bad at math. She’s willing to do just about anything to escape from this identity. Early on she demonstrates this with a casual leaping from a speeding car. Why? To protest her mother’s objections to her applying to an out of state college. You’d think the lesson of a broken arm would teach her that one can’t run from their identity so easily. But Lady Bird is fierce and determined. It takes the journey of this film for Lady Bird to come to appreciate where she came from. Her journey in some ways paralleled my journey in wrestling with my Jewish identity. My journey to becoming a baal teshuva, one who becomes Jewishly observant later in life, has been five years in the making. It’s been a journey of benchmarks, tiny decisions to continue further on the path and loads of conflict. I spent a good chunk of my life running away from Judaism. I used to take a lot of pleasure in arguing with religious people, tearing them down to make them feel wrong. I remember a sleep over when I was in 8th grade where my friends Patrick, Jeremy, and I lambasted my friend Steven for having any sort of faith. Needless to say, Steven didn’t remain religious much longer. I felt becoming religious was a capitulation of the identity I had built. The people I respected and looked up to were all intellectuals who criticized Judeo-Christian values as ignorant and destructive. What’s funny is the first book I was introduced to when I first started to dabble in Torah learning was Rabbi Moshe Chaim Luzzato’s classic work, The Path of the Just. In the introduction, he comments, “The study of [piety] and reading of works of this kind have become the province of those whose minds lack subtlety and who are mentally sluggish… This has given rise to the prevalent idea that anyone striving for piety is suspected of being dull-witted.” I think it was the fact that Luzzato directly addressed my view on religious people that allowed me to set aside apprehensions and to continue on. Like Lady Bird, I struggled with my changing identity. During the first years of my increased observance I would hide my performance of mitzvot from my friends and family. Leaving work early on Friday to go to a Shabbos dinner in the Pico community, I’d tell people I was going to a networking event in Beverly Hills. I refused to wear a kippah in public, so I’d wait for the coast to be clear and surreptitiously cover my head with my sleeve or nearby napkin while saying a blessing before eating or drinking. Then one evening there was a major shift in the way I viewed my Jewish identity. It was my 31st birthday and I was in Tess’s apartment. Tess grew up Mormon but she had walked away from the Church because she always felt looked down upon. Despite that, she still wouldn’t mess around with a guy she didn’t see the potential of having a serious relationship with. That night she’d taken me out to dinner and we ended up alone at her place to watch a movie I know she has no interest in. We started chatting about old relationships and I brought up my last one, a girl named Alexis. It was the first time I had articulated that decision. Our romantic tension immediately dissipated. 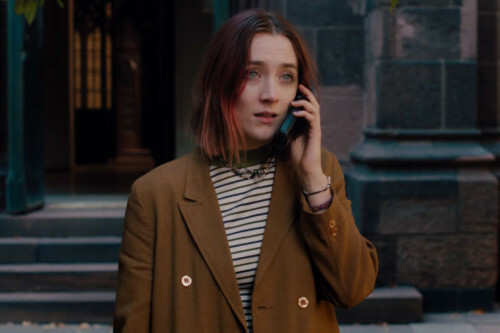 He asks her for her name and for the first time she answers, “Christine,” the name her parents gave her, not Lady Bird. After some further turmoil, she then she calls home, with a newfound appreciation for where she came from. No matter how thin my connection ran, deep down I always respected the values Judaism had brought to the world. The sanctity of life, the importance to question and think, to make the world a better place. These were ideals I received from parents and would hold onto despite my rejection of an “organized religion”. I also knew that before I could completely part from my religion, I would need to take a look at it from an adult perspective and challenge it as strongly as I had challenged Steven in 8th grade. Not from a place of looking for contradictions and deficiencies so I could declare my independence with a clear conscience, but from a place of genuinely trying to understand the other perspective. When I finally did that, I got some good answers. So I asked more questions and continued to get good answers. And in discovering those answers I also discovered a part of who I really am: a questioner who isn’t satisfied with blindly doing anything. I may have taken a different road than my parents, but it’s the values and ideals they instilled in me that lead me here. This piece originally appeared on Aish.com.